The map here above is not updated (as there are 8 regencies and not 6; Nagekeo and Manggarai Timur are missing) but may give you an idea of the island. From east to west the island is 375 kilometers, via the road from Larantuka to labuan Bajo around 660 kilometers. Need a good map of Flores? The most complete map of Flores (2012) with maps of the small towns and some trekking areas. Rp 80.000, available on Flores and at the airports of Jakarta, Bali and Labuan Bajo. The driest month are May to October when it is supposed to be not too rainy. It’s not the rain itself but a heavy and long shower can cause floods and sometimes landslides and potholes as the drainage system is not adequate enough. Trekkings are more difficult or even not possible at all and the sea between Labuan Bajo and Sumbawa and off the southcoast can be rough and boats sometimes don’t run. However a shower now and then keeps Flores green and clean. These days the weather is hardly to predict like anywhere in the world. In January 2016 the mountains around on the westcoast and on the islands off the coast of Labuan Bajo hardly turned back to green again due to (too) little rain since October last year. Most tourists come in June, July and August. Highlights on the island are Kelimutu Lake, Komodo National Park the adat villages around Bajawa, Wae Rebo, Riung Marine park, and diving and snorkelling. Flores is not yet as famous as parts of Kalimantan and Sumatera when it comes to (volcano) trekking but it is definitely competitive with other islands. And, the nature on Flores is a highlight itself. You can travel by plane (but you will miss the beauty of the island). Or by bus together with the locals and everything they carry including chickens, freezers, huge baskets with eggs, a new mattress they bought in town and everything one can imagine. Or by travel, a kind of shared taxi, mostly a big car or a minibus, a bit more expensive than the bus but more comfortable and faster. Or you can hire a car with driver so you can stop whenever you want to. See all kinds of transportation in the regencysections of East Flores, Central Flores or West Flores and the special about transportation on Flores. Let me tell you first that Flores deserves more than a 4 four day trip to Labuan Bajo for diving and see the komodo dragons by chance. Flores has a diversity of attractions. If you only visit Labuan Bajo for Komodo National Park and diving/snorkeling 4 days will be enough, but you will miss the wonderful interior. Said that while Labuan Bajo has become more and more touristy, heading east you will have Flores mostly for yourself. If travelling overland the classic tour starts in Maumere and ends in Labuan Bajo and will be at least 8 days, more comfortable are two weeks or even more. Even better is to start in Larantuka (maybe even a sidetrip to Solor and Adonara). 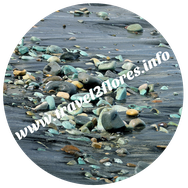 Three to four weeks will give you the most complete impression of Flores. minutes but the road via Todo is more comfortable, well at least for the first half of it. 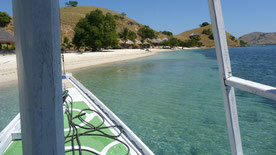 Labuan Bajo has dozens of agents, small offices and people on the road offering trips to Komodo NP. Daytrip to Padar Island (yessss... the one with the awesome views on Komodo Island), Komodo Island (including Pink Beach) and Manta Point is the most populair one. Departure is early morning around 5.30 am and you will be bacjk late afternoon around 16:00 or 17:00 or so,. Daytrip to Rinca island with a snorkling stop on the way back. Trip 2 or 3 days with overnight on the boat . Trips as you like, 1 day, 2 days, 3 days or more. Up to you but of course orivate boat only. There are also possiblities to overnight on several islands in Komodo NP including Rinca Island or Komodo Island. And, yes the dragons sleep there as well. To be honest, I really don' t know. Rp 550.000 for a private boat for a trip Rinca and a "snorkling" Island on the way back but in January 2016 I had to bargain hard to pay 1,7 million instead of the asked 2,3 million for a trip Padar and Komodo. The lowest price I have heard two month ago was 1,5 millon (Rp 1.500.000) for a full day, starting at 5.30 am untill late afternoon. These days there also speedboats for rent starting around 5 million a day. So the message is: shop around and bargain hard. do not book in advance from your home country! Below you will find some travelsuggestions depending on time you want to spend and your interests including the most important highlights like Komodo National Park, Kelimutu lakes and the traditional villages around Bajawa. 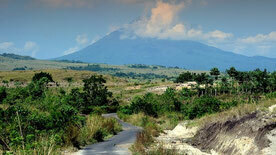 Denpasar (Bali) or Kupang (Timor) are the most convenient airports to start your trip to Flores. If you want to combine your holiday with Sumba, Timor or Alor there are also connections with airports on Flores (check the transport section). The pdf docs here below cover most demands and are counted in full days, thus they don't include your day of departure. The routes are just examples. Send me an email and I can make you a tailored trip. 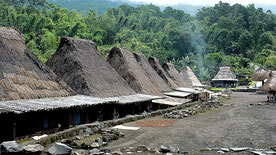 I am still working on detailed trips including Wae Rebo. Be patient. They will online at the end of July 2018. The trips below do not cover trekkings to volcanos like Inerie, Mbeling, Ebulobo or Lewotobi. For those who want to see the Kelimutu lakes with no time at all, it is still possible... Today you'll fly from Denpasar or Kupang to Ende. Continue to Kelimutu and depending on your flight next day you can overnight in Moni (more enjoyable) or Ende. If you overnight in Ende you need a car for one day only. But Moni, on the other hand is more peaceful and you will meet other travelers rather than in Ende. If you like diving, come to Labuan Bajo for an unforgetable trip to Komodo National Park and meet the fairytale (yess.... they still exist) together with the komodo dragons. Fly to Labuan Bajo. Next day at 5:30 am your day will start with the magic sunrise. Enjoy the boattrip and the views on Padar hill. Well... just go there. Flores 0.2 rush through paradise 2 days. With this ultra short trip you still can enjoy Kelimutu AND Komodo National Park. Indeed, you will have to fly within Flores itself which is a pity. But after seeing these two wonders you will be back someday. No doubt. For diving fanatics who have seen "everything" yet.... This is your chance to check out Flores underwater. But please, don't forget the interior east of Labuan Bajo next time. Your visit to Flores wil obtain the absolute highlights like Kelimutu, traditional villages and the stunning landscape around Ruteng (just take any road) and at the end of course Komodo National Park for diving and admire the komodo dragons. To my opinion this should be the minimum time to spend on Flores. Don't get me wrong, I just translate the demands of the average traveler. And, you have enough time to fall in love with the island, just like I did, years ago. This overland tour includes Riung where you can visit Riung National Marine park 17 islands, which is a kind of a mini Komodo NP. But, not only that. It is less touristic, more cosy, less spoiled by tourists. If you have time, this is the one I recommend . You will start in the far east of Flores, in Larantuka. You can spend a day on Adonara and/or Solor which also belong to Flores. Gorgeous "nobody there" beaches on Adonara. Far away from Labuan Bajo, far from tourists. Do I have to say more? Check out the photo's.